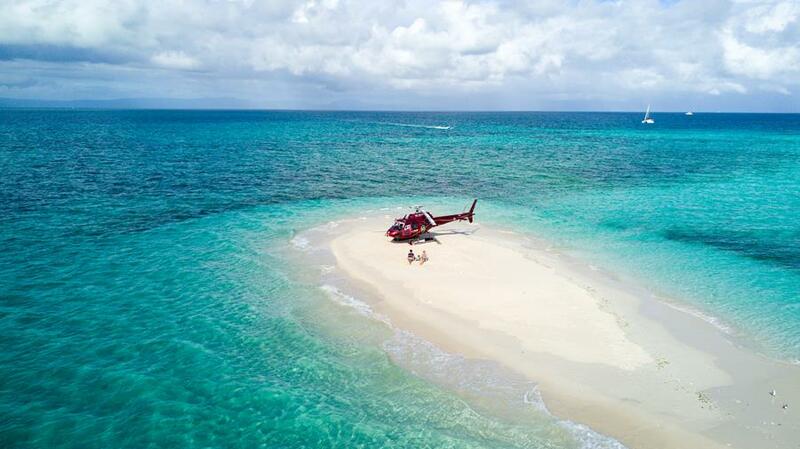 What better way to experience The Great Barrier Reef than on a private helicopter. Let us paint you a picture……Your client/s takes off from either Cairns or Port Douglas and heads out over one of the Natural Wonders of the World. Contrasting shades of blue and green are breathtaking. A small patch of white sand breaks up the colours of the reef as the helicopter descends onto a deserted sand cay. Your client hops out of the helicopter and takes in the vista, before throwing on a mask and snorkel to take in the kaleidoscope of colour that is the Great Barrier Reef. Back on the sand cay, sun lounges are being set up, a picnic basket filled with local treats and delights. You clients comes back onto the cay relaxes and soaks up what has got to be a highlight for any trip to Australia. If your client is looking for a scenic reef flight then Heli Tours North Queensland’s short trips range from 30 minutes up to 60 minutes. 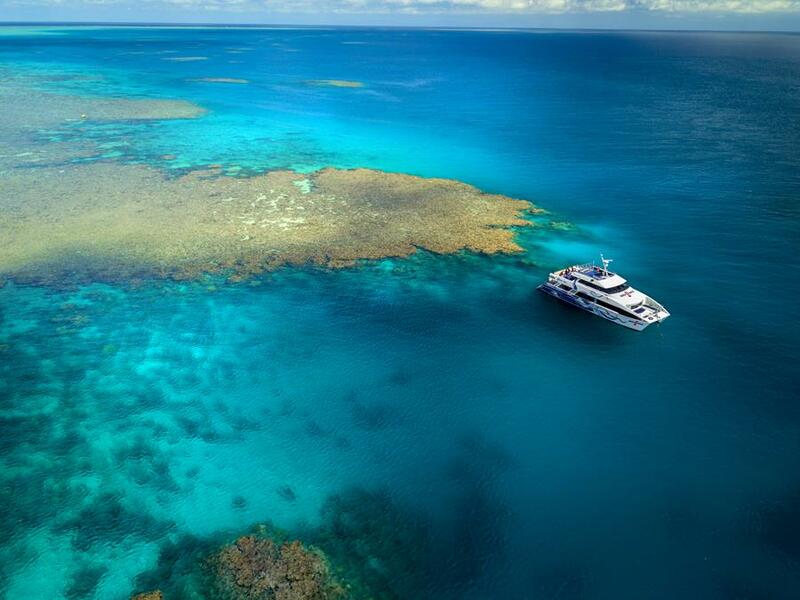 It’s one of their most popular tours, as guests get to appreciate the beauty of the Great Barrier reef from above. It includes return transfers, scenic flight and inflight commentary. Another note worthy tour is the Jarramali Rock Art Day Tour. This is a unique Aboriginal cultural experience, exploring the Quinkan Rock Art sites found among the sandstone escarpments around the small town of Laura, North QLD. Guided by the friendly traditional owners, the Kuku Yalanji people, guests will discover the Magnificent Gallery which provides an extensive legacy and is one of the best on the planet. It has been dated back 50,000 years and your clients will get to experience it privately. This tour includes return transfers, flight to Jarramali Rock Art and the Magnificent Gallery and scenic flight through the Gorge, guided tour, lunch and refreshments and inflight commentary. Divers Den is one of the longest established Great Barrier Reef day tour companies specialising in the Outer Great Barrier Reef. They operate from Cairns and Port Douglas and also offer a liveaboard option. AquaQuest in Port Douglas commenced operation in 2017 and is one of the newest dive and snorkel boats in the area. The tours run daily to Agincourt, Opal and St Crispens Reefs and offers snorkelling options as well as guided and buddy dives. It is the only boat in Port Douglas to offer Nitrox diving. With a max of only 80 people onboard there is plenty of room for guests to enjoy all that AquaQuest has to offer. Guests spend 4 hours on the Great Barrier Reef visiting two different sites. There is a snorkel briefing and marine life presentation. All dive and snorkel equipment, including wetsuits are included. For lunch there is a complete smorgasbord including hot food and a seafood dish. Morning tea and afternoon tea is also provided. Free transfers are provided for guests staying in Port Douglas. AquaQuest is a outstanding alternative away from the large reef boat options and offers your clients a boutique and intimate engagement on the Great Barrier Reef. 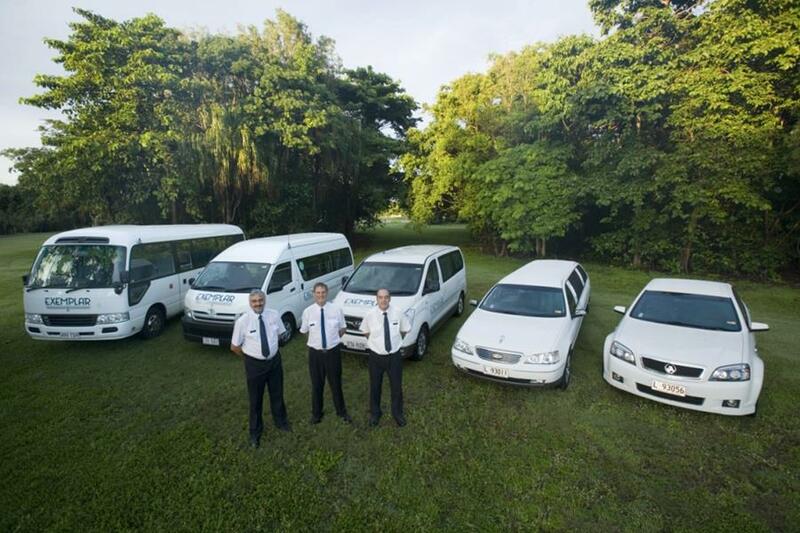 Exemplar Coaches and Limousines is Port Douglas’ longest established, most respected airport transfer company with family roots in Port Douglas going back to 1967. Exemplar specialises in the professional and seamless transportation of guests from Cairns Airport to the resorts of Palm Cove and Port Douglas and the hotels of Cairns, the perfect welcome to guests visiting North Queensland. No more looking for a bus stop or transport desk; Exemplars Airport Concierge will ensure your clients experience through Cairns Airport is a smooth one. Return journeys are as effortless as arrivals with timetables coordinated with aircraft departure so no more hectic last minute check-ins or frustrating waits. Exemplar Coaches and Limousines operates the most number of transfers between Cairns, the Northern Beaches and Port Douglas. For those guests that want to arrival in style private cars or limousines can also be arranged.